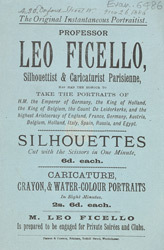 Leo Ficello here advertises himself as a "Silhouettist and Caricaturist Parisienne". A silhouette was generally a portrait of a person obtained by tracing the outline of their profile, head, or figure by means of its shadow or in some other way, and filling in the whole with black. These images had been something of a craze in the 18th century, and evidently remained a popular novelty well into the Victorian era. They were named after an 18th-century French Controller-general, Etienne de Silhouette, who was apparently in the habit of making outline portraits of his friends.